One of BMPRO brand ambassadors, Mark Simpson, shares his personal experience in using BC300 for wireless monitoring of high currents and directly connected loads. With technical background in IT, Mark loves gadgets and data. He travels a lot with his son, going on 4×4 adventures, in his Prado with the swags. When travelling with his wife and two gorgeous dogs, Mark is enjoying the comfort of his new Jayco Journey. “My wife, Lee and I have a 2018 Jayco Journey touring van, 22 foot long. It is big, it is beautiful and it’s ours. We recently did a short 4-day weekend trip (with the two fur babies) where we were in a van park with 240v available, but I wanted to test 12v systems we have installed, before we head off on our big trip next year. Lee and I both run CPAP machines at night, so being able to monitor the power draw through the inverter is very important to us. However, the standard BMPRO J35B with JControl panel in our van could not manage/monitor this draw as it did not know about the inverter, which is hooked up directly to the house batteries. I contacted Team BMPRO and they suggested the BC300 300amp shunt with CommLink connected to the J35. We took it with us on the above trip for me to install. The first night away, without the BC300 connected, we used more power than I anticipated. The next day I installed the BC300 with CommLink to my house battery bank (2 x 120ah batteries). Negative terminal on one battery and Positive terminal to the other. Plugged the CommLink into the J35, easy as pie. 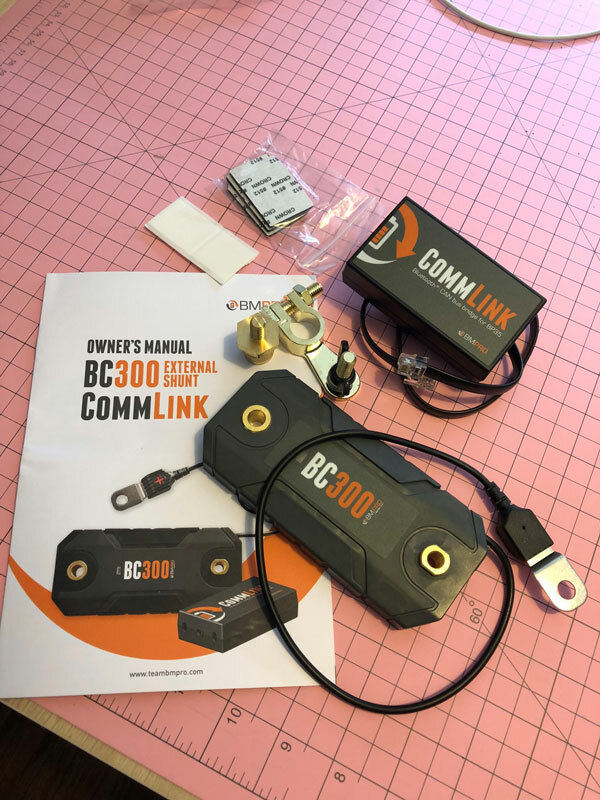 The CommLink device connected to the BC300 via Bluetooth as documented. So it was really a simple install. A quick test on the power draw through the inverter, by making two really nice cups of coffee, freshly ground beans, steamed milk, yum, with the Barista Express. The JControl saw the power draw of the coffee machine which proved to me the BC300 and CommLink was doing what it was supposed to do. Brilliant. Now to test the draw of those CPAP machines. My machine is an older one, it measured 1.5 amps, so not too bad and that was with humidifier connected. My wife’s machine however is a new ‘super efficient’ super quiet machine. This sneaky little thing was drawing 6.5 amps. Efficient, not so much… Investigating, I found Lee’s machine’s humidity was set really high, so i adjusted it down to match mine. Now its power draw was less than 1.5, more like 0.7-1.0. Winning. 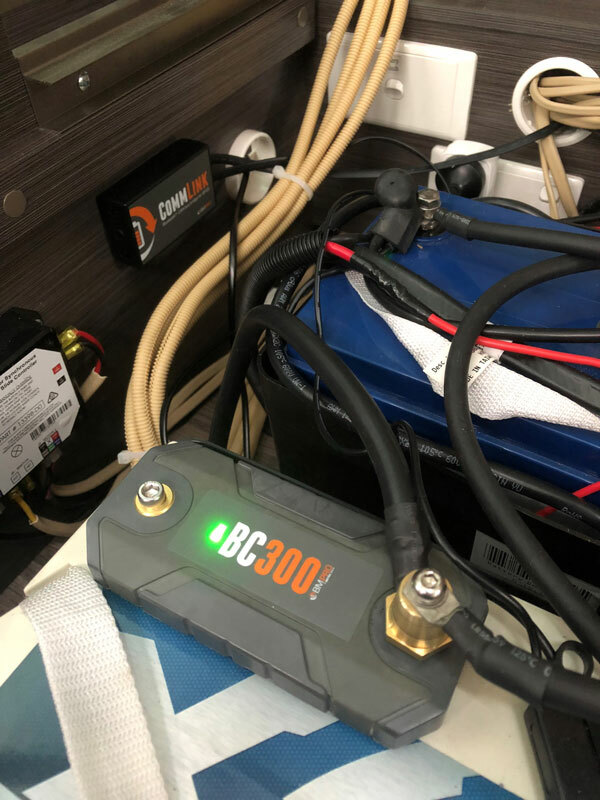 If you are using an inverter, BC300 with CommLink allow monitoring the currents drawn from the battery much more accurately and keep total control over your power needs. BC300 is designed to be used with BMPRO power management systems, such as BP35 and J35. It communicates with the units via Bluetooth and CAN BUS. Just wondering what sort of CPAP Machines were being used. I use a Resmed S9 with H5 Humidifier with the appropriate Resmed 12 volt adapter. I just recently experimented with mine on a dedicated battery alone with the both the Heater and Humidifier turned off on the machine. This worked a treat and I had at least 6 comfortable nights averaging 6.5H sleep without recharging the dedicated battery. Hi Alan, I have the same machine, Resmed S9 Autosense with H5 humidifier. My humidity settings was at 23c. My wife uses a Resmed Airsense 10 for her, her humidity setting was at 30c, so used a lot more power. No 12v adapter, no 12v battery. This was connected directly to the inverter with the same plugs and power packs we use at home.